We are the prominent manufacturer and supplier of a wide range of Air Bubble Film Roll that also provides very good surface protection and prevention against vibration and shocks. The offered film roll is perfect for packing glossy and fragile items such as chinaware and glassware. 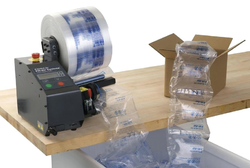 Offered film roll is ideal for protecting fragile and irregularly shaped products. This film roll is available in numerous specifications according to the needs of our clients. With the Fill-Air Cyclone system, installation is a breeze. The simple yet sophisticated design requires minimal training. The system is shipped in a small carton, and simply needs to be plugged in and loaded with film to begin making packaging material. No shop air is required. The Fill-Air Cyclone has a compact footprint (less than1.5 sq. ft.) that makes it ideal for tabletop placement at a pack station. Push-button operation allows material to be created on demand. Material can also be batched into bins for use at satellite packaging stations. An auto-replenishment sensor can be implemented to maintain a consistent supply of material at all times. Sealed Air is committed to providing solutions to our customers’ environmental challenges in a reliable, cost-effective and responsible manner. Because Fill-Air material inflates on-site, it takes up a fraction of the truck space needed to ship conventional packaging materials, greatly reducing the transportation impact. For more information. 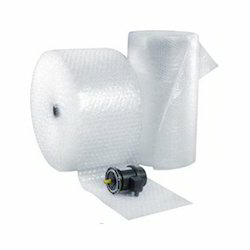 20.5" x 17" x 18.5"
Looking for Air Bubble Film Roll ?